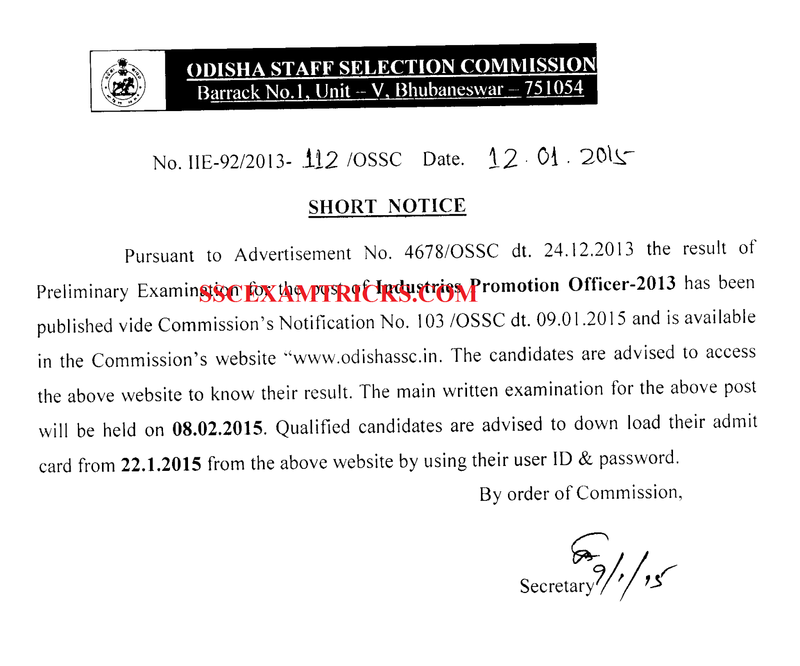 Orissa Staff Service Commission (OSSC) has released online admit cards/call letters/ hall tickets for Main written exam which is going to conduct on 08th February 2015 for the industrial promotion officers at various centres in all over the state. The Latest News is that those candidates who have applied for the exam and waiting for the online admit cards / Call letters for Main Written Exam can download their admit card on the direct link provided in the end of the post. OSSC IPO Main Exam will be conducted by Pen Mode. Main Exam will contain Paper 1 and Paper 2. Paper I will be of 100 Marks and Paper II will be of 200 Marks. The total time duration will be of 2 hours for each paper. The qualified candidates of OSSC IPO Main Exam 2015 will be called for next stage which will be an interview round conducted by OSSC officials. The dates, time and venue of interview will be mentioned in the interview call letter released by OSSC. After the completion of interview stage, a final merit list or Final List of selected candidates will be released on the official website by OSSC.